Important: Some of the content in this topic may not be applicable to some languages. You can quickly filter data based on visual criteria, such as font color, cell color, or icon sets. And you can filter whether you have formatted cells, applied cell styles, or used conditional formatting. 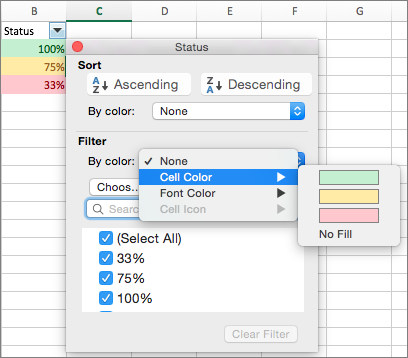 In a range of cells or a table column, click a cell that contains the cell color, font color, or icon that you want to filter by. On the Data tab, click Filter. Click the arrow in the column that contains the content that you want to filter. Under Filter, in the By color pop-up menu, select Cell Color, Font Color, or Cell Icon, and then click the criteria. On the Standard toolbar, click Filter . Under Filter, in the By color pop-up menu, select Cell Color, Font Color, or Cell Icon, and then click a color.